When I first began to lead worship at my Dad’s church back home in South Africa, I encountered the commonly held attitude that “God deserves excellence in worship”. I reluctantly accepted this as truth and have struggled through a variety of worship teams where excellence was a far off dream. So it was with some relief that I listened to Nadia Boltz-Weber from The House of All Sinners and Saints in Denver speaking at Greenbelt 2014 about their value of “anti-excellence, pro-participation”. “What you lose,” explained Nadia “is any control” but she went on to describe the beautiful, unexpected and profound moments that you get instead. Moments where God can be seen working through God’s people; the body of Christ acting as one. I was inspired, but joined the audience in thinking it was an impossible ideal that would struggle to find its place. When the ChYP’s Ministry Network Days started up again after the summer, I was all set to grab a guitar as normal but decided, instead to experiment with the “pro-participation” model and stumbled onto the idea of DIY Worship. It was surprisingly simple really: I borrowed the five titles from my CafeStyle model of church, which is a simplified version of Common Worship, and wrote them up on a board. Enter, Encounter, Explore, Express, Exit – each with a short descriptor: gather together, connect together, discover together, discuss together, send each other. 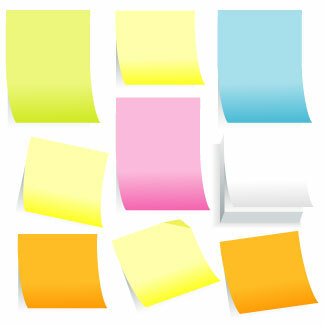 Armed with God’s favourite ministry tool – the Post-It Note – I invited everyone present, yes everyone, to write on a Post-It any short activity that they would like to lead that would fit under one of the five headings. I had a guitar, paper, pens, playdough, stones, a computer with internet and offered any or all of it. It took a few moments of explanation but four minutes later we had a number of Post-It notes covering the board. All we needed to do then was simply go through the parts of the worship, one by one. Whoever wrote something down led that part, from where they were sitting, or from the front or they asked me to just play a clip from YouTube. It wasn’t seamless, but I was certainly Spirit filled. There were reflections, there were prayers based on pieces of scripture, there was playdough prayers and responsorial prayers, a short message from a passage, a video montage put to music, a traditional blessing and times of silence. As I reflected on our time of worship after the day, I was struck by a few surprises. It wasn’t surprising that it worked, but it was surprising that it followed a theme. It wasn’t surprising that it was rough around the edges but it was overwhelmingly filled with that Shalom peace that is only describable as a roaring, deep sense of ‘OKness’. So we did it again a couple of months later. And now it is a thing we will come back to. It is my new favourite way of doing worship together, because it helps us remember that worship is not about control. It’s not about how right or good or slick or loud or symbolic or creative we can make it. It is simply that time when we gather to respond to the God stuff in our lives… together. 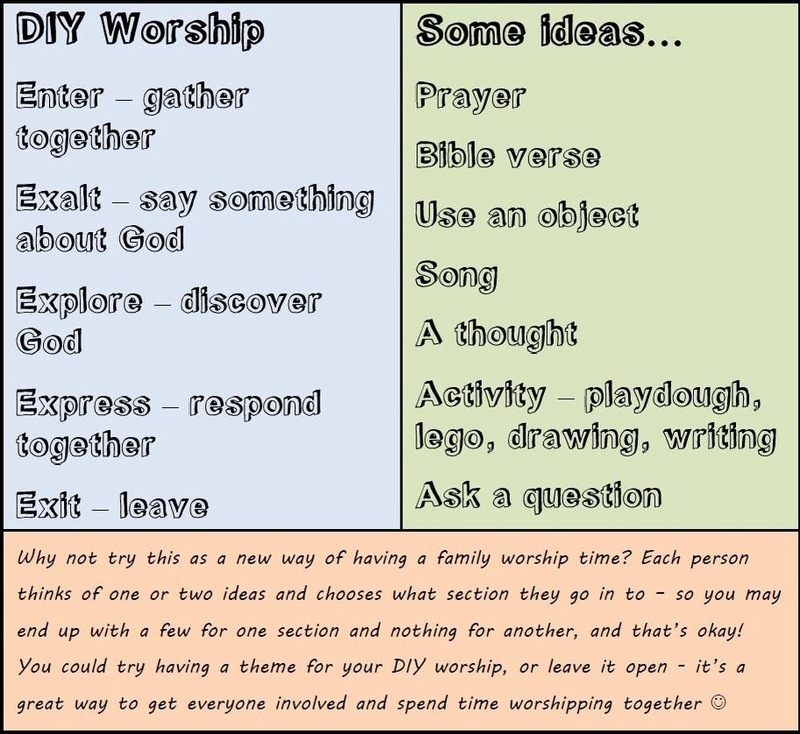 If you like the idea of DIY Worship even a little, give it a go. Yes, there is a risk that it will fall flat. Yes there is a risk that it will be unexpected. Yes there is a risk that it will be too long or too short or too informal or too wordy or too imposing. But it is based wholly on the idea of God’s people coming together to respond to God together – across ages, experience, churchmanship and ability. Another step towards becoming Whole Church?